and Air Conditioning (HVAC) environments. air handlers, economizer units, VAV terminal units, fan shutters, and unit ventilators. VCP spring return damper actuators to be direct mount on standard damper shafts to control dampers. The spring return damper actuators from VCP are supplied with anti rotation bracket provided for stability, position indicator and energy savings at end stops. 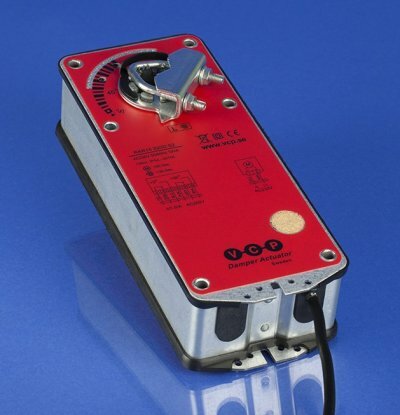 10 Nm and with control signal on/off (two-position) are used to regulate dampers up to approx. 2.0 m². Running time for the RAR10 24D and RAR10 220D spring return damper actuators is 100 seconds for the actuator and < 25 seconds for the spring. RAR10 24D S2 and RAR10 220D S2.